Home » Fitness » Busted! It was a relatively quiet period in the gym today when I was sneakily watching a gym member quickly and efficiently perform a series of torturous looking pull up variations. After immediately being impressed at the strength displayed I started to feel cheated at how hard pull ups were for us girls in comparison to some guys. The reasons were obvious, the shoulder width and of course muscular strength and ability for males is often used everyday in their trades and manual labour. It’s common for us girls to lose our overhead strength when we get used to everyday movements involving pushing and pulling but little bodyweight overhead exercises. It is also then common for us to experience shoulder injuries or back problems when we do have to lift a box from overhead, or engage in any similar movement. Following that train of thought I have decided to include some technique points on the dreaded pull up for those of us who lack upper body strength but want to conquer one of the toughest body weight exercises. Squeeze the bar – make sure you have a good grip. Breathe at the bottom – Take a big breath before pulling yourself up. Chest up – Lead with the chest up, shoulders back and core tight. Keep your eyes up – Look up at the bar. Elbows down – Drive with elbows down to the floor while squeezing your lats. Bend your legs & cross your feet – Letting your legs hang dead can mean less strength. Try these techniques or practice more than one for quick progress. Ask For Help – Ask someone to assist you, trainers have various methods such as resistance bands and spotting. 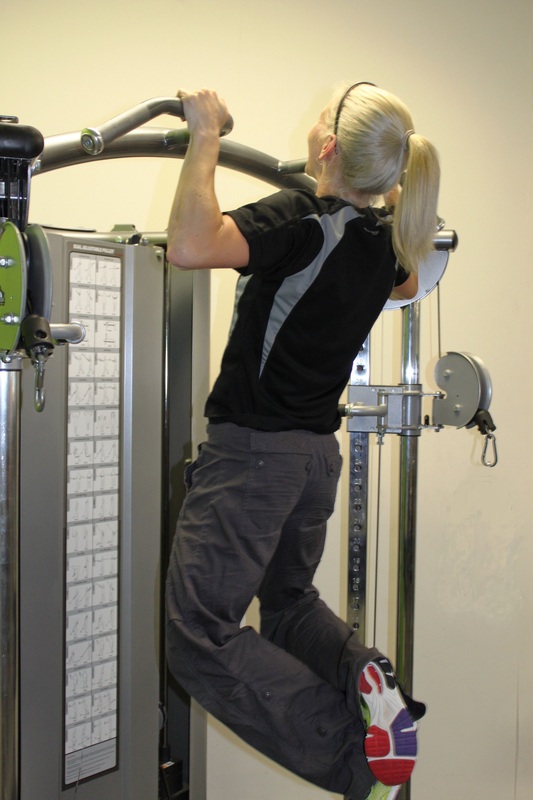 Stay away from assisted machines – This is if you want to develop the strength for a real pull up. Machines will rarely develop strength that translates into a real bodyweight pull up on their own. If you are long off achieving a body weight pull up, use the machine along with jumping and negative pull ups to improve. Kipping Pull-ups – Swing your hips while pulling up until you get stronger. Negative Reps – Jump up with your chin high and control your descent as slowly as possible to keep the muscles contracted for as long as you can until you fail.